Most were what we call “Long Term London Ladies,” married to business leaders, government officials and often British citizens. 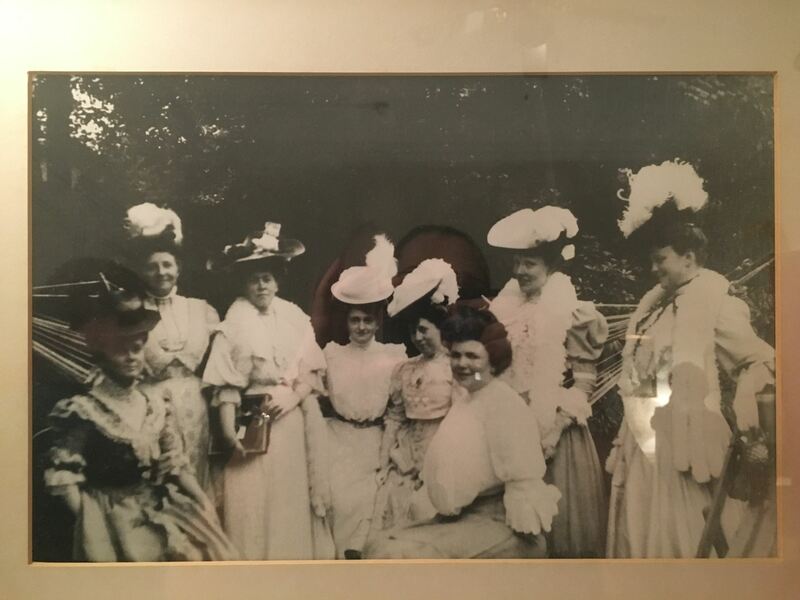 Distinguished members included Lady Randolph Churchill (Jennie Jerome), mother of Winston; Lady Astor, the Duchess of Marlborough; Mrs. Selfridge; and Mrs. Herbert Hoover. Meetings took place at members’ homes and a monthly luncheon was held at a hotel. Then, in 1916, the club’s president procured a £25,000 loan from Barclay’s Bank to purchase a full-fledged clubhouse in the form of a 30-bedroom mansion on Grosvenor Street — complete with an Italian-style garden, a fountain from Florence, a ballroom with a built-in pipe organ and a library — and to fully staff it with housekeeping servants. To pay off the loan, she sold debentures paying 5% to the members. The house became a gathering point for European and American artists, attracted many famous visitors and became a centre for the club’s community efforts. The club provided help, advice and cooperation for other organizations, individuals, movements, charities, schools and churches. It was consulted on educational, social, philanthropic, economic, artistic and literary subjects. The club’s first activity was to outfit a hospital ship, the HMS Maine, which brought home British soldiers who survived the Boar Wars and then later entered international waters in China during the Boxer Rebellion. After the outbreak of World War I, AWC women served in the Red Cross, created an Infant Welfare Committee, and operated a knitting factory that employed 45 women and turned out socks, mittens and sweaters. They established a “Lost Nationality Committee” for those displaced by the war, set up a Convalescent Ward at the North Islington Maternity Center, and created a Relief Committee for American Women Resident in England. In 1931 Club President Mrs. Curtis Brown helped form the Federation of American Women’s Clubs Overseas — FAWCO — an NGO with the United Nations. She believed that expatriate American women could be effective in demonstrating tolerance, good will and generosity while living abroad. This club is still a proud and active member of FAWCO and contributes greatly to its efforts here and abroad, forming links with other American women worldwide. With the outbreak of the Second World War, many Americans returned to the US. Most of the furniture, records and other effects from the house on Grosvenor Street were put into storage, and AWC women worked in the basement assembling relief items while the ballroom was used by the US Embassy to assist Americans. Eventually, the cost of running the house was too much and it was sold in 1945 for £45,000. The club moved to a new location at Upper Brook Street in 1946 and then to a less expensive flat at Queens Gate, near Hyde Park. There they hosted a party for Eleanor Roosevelt and welcomed visitors such as Her Majesty Queen Elizabeth, the Queen Mother, the Duchess of Kent and Princess Alexandra. Membership started to rebuild and by 1951 there were 250 members. Organizing a popular annual jumble sale to benefit the Kingsdown Home for Old Ladies in Barnet and Beuchamp Lodge Settlement House in Paddington. Fundraising to purchase a Meals-on-Wheels van for the Women’s Voluntary Service. Launching the Golden Eagle Ball in 1963, which became an important annual fundraiser. Proceeds from the event benefitted entities such as White Fleet, a ship that traveled to provide medical care and educational services to the poor in Southeast Asia; the research wing of the Royal Hospital and Home for Incurables; the Royal Marsden Hospital; the Prince’s Trust / Youth Business Initiative; the Special Baby Care Unit at Westminster Hospital and the British Association of Cancer United Patients. Charities for children included Paul Newman’s Hole in the Wall Gang Camp, Refuge and Habitat for Humanity, not to mention Ronald McDonald House, which we still actively support. The AWC continues to contribute to local charities; gives support to new members who have just moved to London through our Area Friends; organizes trips to museums, historical sites and cultural centres; supports new and expecting mothers; raises awareness of topics of interest and importance such as health and history; and provides friendship, entertainment and hospitality through our different social activities. The AWC has moved into the 21st century with a lively, interested and involved membership. We remain as engaged as ever and consider it a privilege to participate in community service in our London neighborhoods.